are right to appreciate such beauty. My laptop has come back from the menders with a new vocation. While away it was sent back to factory settings so it's decided to dedicate its life now to incessant up-dating. Slow, slow, quick, quick, slow. Still. It's pleasant to have a new keyboard; and for the mouse pad to work; and not to need to press the same buttons over and over before anything happens. There are, of course, masses of things to catch up with so I'm only partly here. There are on-line bills to check, emails to send and a general gearing up. Over this non-computer period I've been doing different things and it's odd how odd it feels to be returning to normal. It's that funny kind of feeling at the end of the long summer break from school. It means you will be seeing your friends again - but affection for being on holiday lingers on. 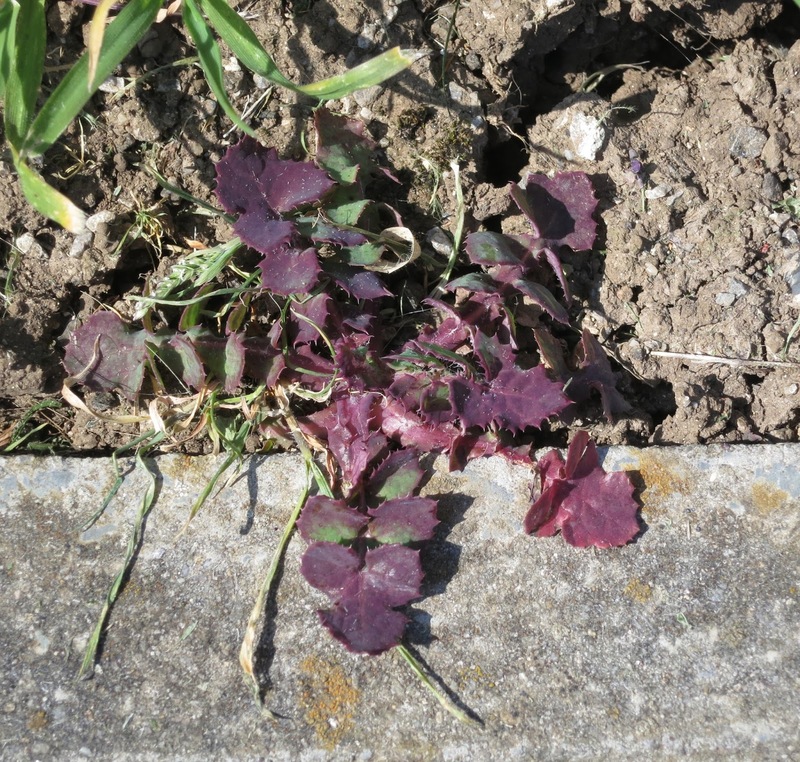 The sun has come out to celebrate so I've been on a quick look around for plants growing in the streets. Where playgrounds meet pavements - that's a good place to look. Dandelions come at the top of my list of favourites and, all of a sudden, there are loads of them. 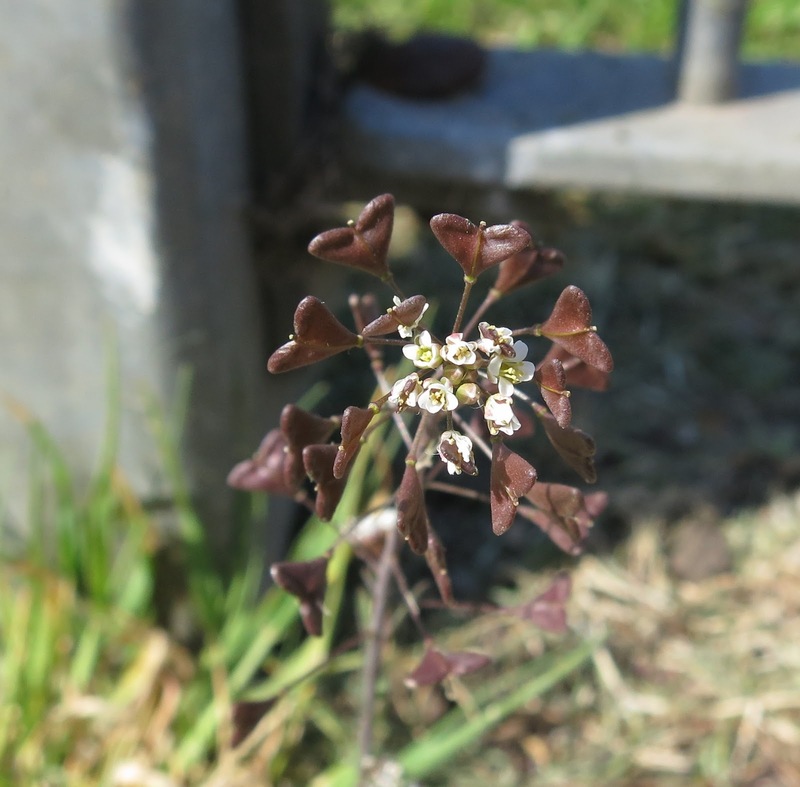 Shepherd's Purse (Capsella bursa-pastoris) with its tiny white flowers and heart-shaped seed pods also comes pretty high on my street-plant list. And then there is grass in its many states and varieties. I really do like the single plants which pop up through tarmac, grow beside bench legs and establish themselves between paving stones. This little lawn has already dried out and gone to seed. Have you been noticing new plants in the streets near you? If so, why not post about them and put a link in the box below? It will be good to see what you see too. The box will be open till 7pm on the 25th April. So pleased you are back in full working order! That is one thing you don't see here, plants in the street, but I do have plants popping up in between the bricks of my sidewalk and patio. Dandelions will be up soon here. Hello Pat at Squirrelbasket. There is no way I could count how many times I've tried to photograph Shepherd's Purse over the years and how many blurs have resulted. The seed pods seem to act like sails so it's always quivering. Other plants are more compliant about standing still. Hello Donna. Why is that? One would have thought if plants can pop up between the bricks in your sidewalk and patio they would have found places along the pavements too. Are the local authorities a little over-keen on tidiness or 'weeding'? Glad to hear you are back with us! Not sure I'll make this gathering as I'm traveling ... but maybe I'll find something fun. Oo good, L & L back as well as MiaMB. 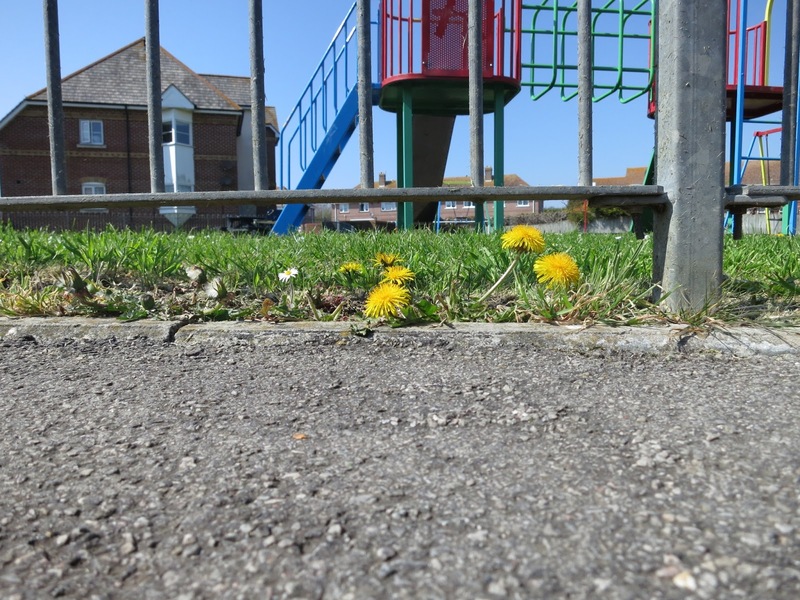 Dandelions are very cheerful to see but I have also noticed this year (because I looked for the first time) that they are very important providing food for early bees. Street plants are things we do well here in Edinburgh, courtesy of our local council! 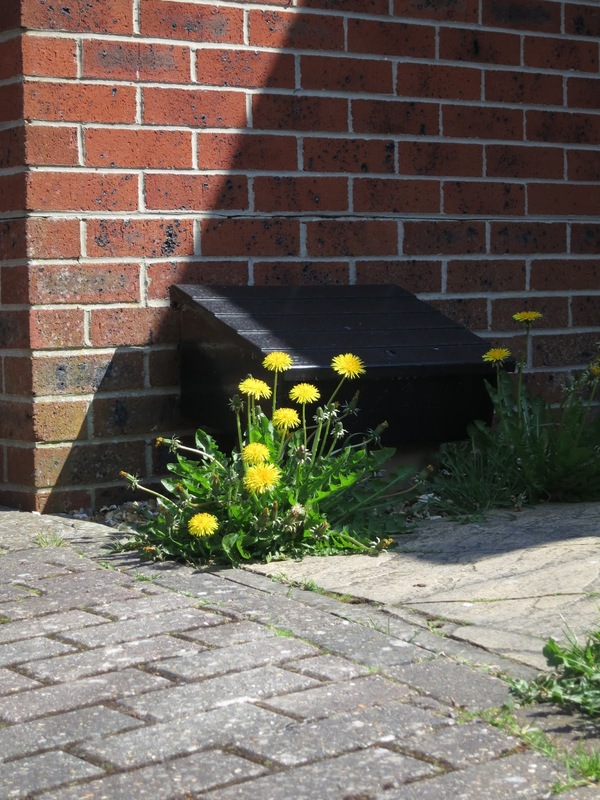 I've a wee row of lawn daisies growing in the kerbside opposite my gate and the dandelions!!!! 'nuff said!! Lucy, I had to do 2 posts! I collaborated to some extent on both and folks were excited about the projects :-) I hope I didn't mess anything up. Glad to hear that your computer woes are a thing of the past Lucy. I pass a bank of grass dotted with daisies and dandelions on my way to the allotment. It has looked an absolute picture this week.